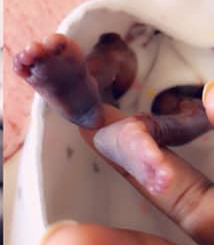 A’Brianna D’ior Roby-Davenport, the daughter of Dereon Equwan Davenport and Latasia Lynn Roby, was born prematurely at the University of Iowa Hospital and Clinics on April 1, 2019. She has joined in heaven, her sisters, Zharielle, Zharianna and A’Miracle Roby-Phipps; and her great-grandmothers, Ella Mae Bennett and Robin Roby. She is survived by her parents; her brother, Zabian Charles Barrett; her grandparents: Latina Roby of Waterloo, Sharita Davenport of Rockford, IL and Lee Galloway, Jr. of NC; great-grandparents: Sherry Davenport and James Timberlake of Waterloo and Mary and Lee Galloway, Sr. of Waterloo; her aunts: Dahzhanel Roby of Waterloo, Kelise Galloway of NC, I’yuana Johnson of Rockford, IL, and Imari Johnson of Rockford; her uncles: Daytrell Washington-Roby of Waterloo, Dana Scott, Jr. of Waterloo, Javez Galloway of Waterloo and Kelon Galloway of NC; her great-aunts: Veronica (Berry) Dungy of San Antonio, TX, Melissa Roby of Waterloo, Lakeisha White of Waterloo, Aieshah Davenport of Waterloo, Courtney Galloway of TX and Shuntae (Rickey) Chance of Rockford; Cousins: Queshawn Roby of Waterloo, Quintaurs Roby of Waterloo, Jadale Roby of Waterloo and Delajah Smith of Waterloo; and her Uncle/Godfather, Marquavion Galloway and Godfather, Jacqurius Owens.